In the whole wide world of drinks, there’s nothing more intimidating to me than a sake menu. Staring at the thirty-six selections at Kushi Izakaya & Sushi, my brain usually goes blank. Add shochu and my head really spins. It may be the Japanese. At least I can bumble my way through a French wine list, but sake? Forget it. So when my WLDC partner-in-photographic-crime Max Cook and I had the chance to spend some time with their beverage director, George Young, to learn about sake, we jumped. Well, I jumped, Max loves sushi more than sake. But after just an hour reviewing the basics of production and sampling the menu, I felt much less intimidated and am now eager to explore more. Luckily, George himself is newly converted to the joys of sake and proved the perfect host to de-mystify the nature of rice wine. Wait, let’s start with that phrase – sake isn’t actually “rice wine,” as wine implies production from fruit. 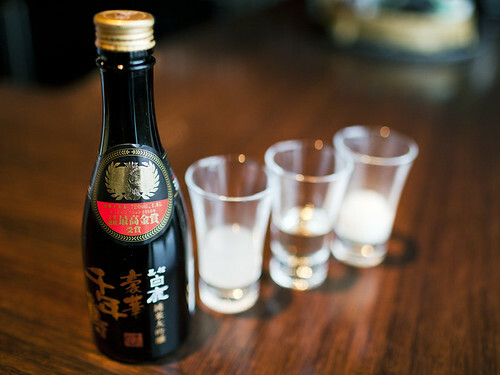 Sake comes from rice, and therefore is considered its own category. But how does rice become sake? What’s the difference between those cloudy white liquids and the clear ones? And what about hot versus cold? George patiently explained it all for us. 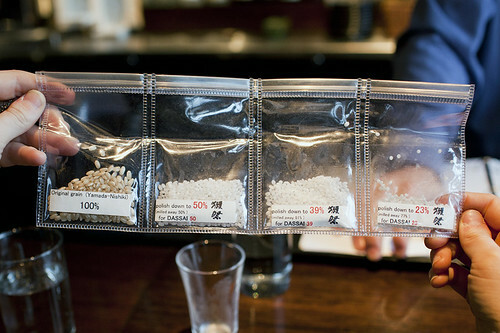 When you’re at the sake bar at Kushi, ask to see the packets of rice they keep on hand to show the difference between the various percentages of polished rice. It helps illustrate the production process, and was fascinating to me. Making sake starts with the original grain, which is then polished down to remove the bran and get to the starch in the center. The more you polish, the more the flavor is affected. After all that polishing abuse, the rice takes a spa break – resting and then soaking in water. It needs to rest otherwise the kernels might crack open in the bath (rather like me on a bad day). Then it’s steamed. Traditionally at this point it was left outside to gather mold. Nowadays they add special strains of mold in a scientifically controlled environment, so don’t freak out. Mold breaks down the starches to sugar, and yeast is added to convert the sugars to alcohol- it’s called parallel fermentation as the mold and yeast react at the same time. Ah, perfect harmony, resulting in an ability to brew up to 20% alcohol. But you’re not drinking it yet! It’s got to mash, mash, mash and then get pressed before finally being filtered by either coarse or charcoal methods. The whole process has a lot more in common with beer than with wine. Kushi’s sake menu is helpfully divided into the different styles of sake, from nigori (unfiltered), nama (unpasteurized, basically a living bottle of liquid) and honjozo (an old style brew with rice polished below 70%), to ginjo (below 60%), daiginjo (below 50%), and so on. They’ve also ascribed a “Sake Meter Value” to each bottle to help you navigate between sweet and dry. 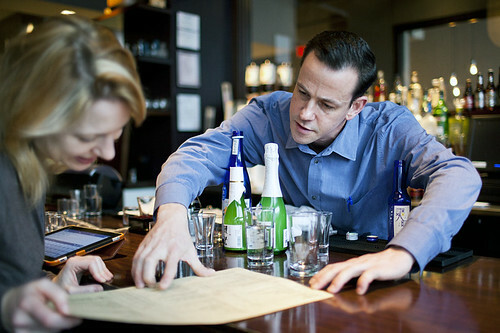 It may be the most helpful sake menu I’ve seen, and George’s staff has undergone an extensive education to steer you towards the best bottle for you. I’ve tried nigori in the past and was curious to sample a good bottle of the unfiltered, milky white sake. George poured out a cup of Hakushika “Snow Beauty” for me, with an SMV of 55- which would make it one of the sweetest on the menu. To me, the flavor didn’t register as strongly sweet, but more tart at the finish, probably due to the acidity content. Since the Kushi tasting I’ve ordered it again and just love the full-bodied, rich viscosity with that kick at the end. On the other end of the spectrum were two filtered sakes. First up, the Born Muroka “Nama Genshu” with an SMV of 4+ making it semi-dry, and it’s a junmai daiginjo, so the rice was polished below 50%. There were hints of cherry and oak, highlighting for me just how complex sake can be. The clear favorite for me was the Hakushika Kuromatsu “Noble Crane” (side note, I love the poetic names), with an SMV of 1-, just a touch semi-sweet. I’ve been practicing saying it three times fast ever since. The flavor was delightful, to my palate faintly reminiscent of mead without any cloying sweetness. 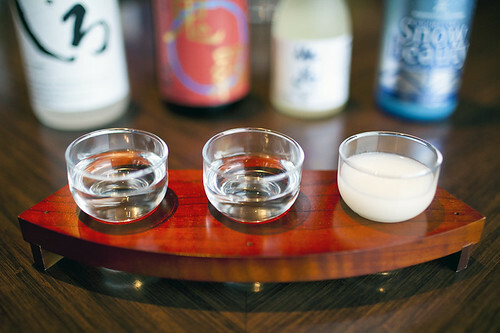 One of the best ways to learn about sake at Kushi is to do a flight of three different types, as we did, so you can understand the variations. Food pairing is also a good way to get into it. George suggested pairing the unfiltered sake with more oily fish like mackerel, and the filtered sake with more delicate fish. Then there’s the hot versus cold question. Serving sake hot came about in the good old days before pasteurization, George explained, and is still done in the winter, but higher quality sake should always be drunk cold. There’s obviously a lot still to learn about sake, and I’m inspired to do more research. If that means I have to drink sake and eat sushi alongside it for days, that’s hardly a sacrifice. If you’re not a sushi fan, Kushi is also known for its robata wood-grilling, and the smell alone drive me crazy while sitting at the bar. And if you just can’t get into sake, there’s plenty of liquid lessons to learn about Japanese whisky! Diving into the careful craft of another culture’s beverages is simply rewarding. 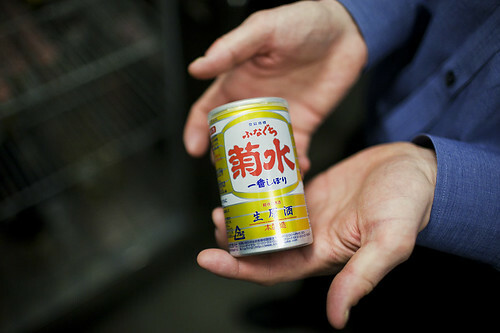 While showing us the sake cold storage, George told us about the little cans of sake that are sold in vending machines in Japan. When it neatly combines my love of miniatures with convenient innovation, how can I not love sake now? Kushi Izakaya & Sushi is located at 465 K Street NW, Washington DC 20001. Closest Metro: Convention Center (Yellow/Green lines). For more information call 202-682-3123.